Rotherham-based electronics retailer, Maplin is celebrating one of its strongest Christmas trading periods, with like-for-like sales up 4.4% in the six weeks to December 24. 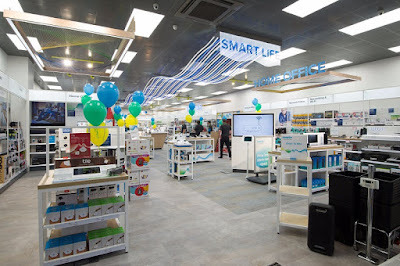 Manvers-based Maplin sells a range of products to tech-savvy hobbyists as well as general consumers and now operates from 217 stores. In store, like-for-like sales were up by 1.4% for Christmas 2016 compare to the festive period last year. Online sales rose by 29.3% when compared to the previous period, which the retailer attributes to significant investment in its digital channels. The firm, which was sold for £85m to new owners, Rutland Partners in 2014, said growth was achieved over a number of categories, with popular products including Google's Chromecast, Amazon Fire Stick, drones and everyday products like batteries. Oliver Meakin, chief executive at Maplin, said: "Christmas 2016 has been one of our most successful trading periods and highlights the significant investment we have made across our whole business in the last two years. "As we accelerate investment in digital, our people and stores into 2017 we expect to see sales continue to grow, as well as develop other initiatives including the roll out of a new store format and refreshed branding across the estate, which was first trialled at Cambridge Beehive in November 2016 (pictured)." For the financial year to March 19 2016, turnover at Maplin was £235m, a slight reduction from the £236m recorded in the previous year. EBITDA (earnings before tax) was £12.7m, down from £16.2m. The period saw Meakin take the CEO job and new management teams put in place, including the appointment of Lindsay Dunsmuir as chief financial officer and Siobhan Fitzpatrick as e-commerce & marketing director. The period, which also saw the departure of chief technology officer, Neil McGowan, was described as a "year of change." The financial figures were described as credible in the face of falling footfall on the High Street. It was an increase in internet sales by 15.4% that offered encouragement. Meakin added: "The arrival of the new executive management team afforded us the opportunity to review our future strategy – starting with listening again to our customers, our colleagues and consumers through multiple focus groups. The feedback was compelling.